Do you always want to know where your valuable property is? Install a wireless GPS Track and Trace system (a GeoLocker tracking system) in your vehicle or mobile object and you will always know exactly where it is. The GPS tracking system is also suitable to manage multiple objects. Use a timer and you can configure whether you want to know where the object is each hour, day or week. Do you want to track your valuable property? Do you want to know where your object is or do you want to know where it has been afterwards? We provide insight into this by using the GeoMotion function. This function ensures that every journey is registered. This ensures that systems that have this function are suitable for keeping track of the journey and kilometer registration. You can monitor your valuable property with our GPS Track and Trace systems even when they do not have their own power supply. The GPS tracking systems are easy to install and difficult to trace and switch off. You can draw a virtual fence around your object and, if your object is outside this fence, you will automatically receive an alert through an SMS and/or email message. We call this GeoFence. If your vehicle is moved without the ignition having been switched on, the anti-theft alarm will be sounded and you will be warned. The GPS tracing systems are, moreover, protected against sabotage. 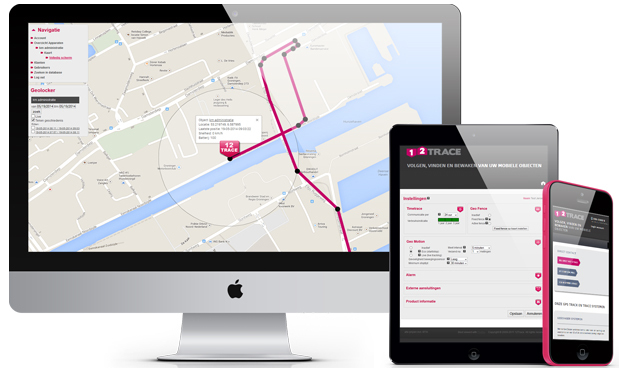 Do you want to find out what our GPS Track and Trace system can do? View the video.